My 2016 Prius can transport a bike with 2 seats folded, so 3 seats are left. The Prius V might be able to hold a bike with no seats folded. 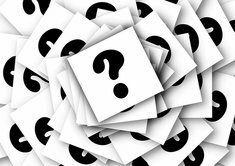 Car and Driver said about the Prius V, "A full-size men's mountain bike slid in with no trouble once the front wheel was removed." 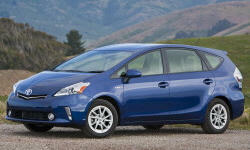 The Prius V is a midsize wagon, smaller than an Outback or Golf Sportwagen. Definitely beats the cargo capacity of a regular Prius with the second row folded. 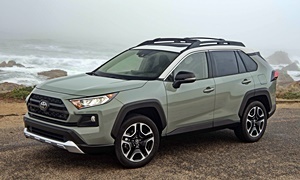 They also make bike racks for the regular Prius and Prius V.
If you don't want to remove the wheel (no one does), the Toyota RAV4 Hybrid can fit two bikes in the trunk at the same time with the rear seats still up. 5 people and two bikes. Get the 2018 RAV4 Hybrid XLE with the Hybrid Convenience Package which gives you blind spot monitoring, rear cross traffic alert, power liftgate, and a better infotainment system with navigation. It's a good value, very reliable, and comfortable. Our old 2013 Buick Encore would fit to your liking and see about 40 mpg if you keep it at the speed limit. Unlike most economy cars that get 40 mpg, the Encore can be optioned for AWD. Brand new 2017 Buick Encore can be found for $20,000 or under and have the longest warranty in the segement due to it's near luxury category. 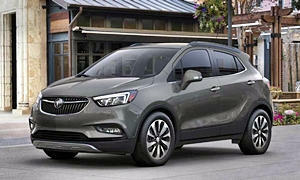 Looks like most brand new Buick Encore's are $10,000 or $16,000-18,000. The Encore does not do the two things this guy wanted: be electric/hybrid and carry a bike with 5 people. I don't think there are any GMs that fit that bill. No reason to be anti-GM. The Encore's split rear seat would handle a bicycle just like the Prius and 3 passengers open. Or you could fold the front passenger and one side of the back seat for longer items and still have two seating areas. And you do not have to remove any part of the seat or the headrest to do it like the Prius. Plus the Encore offers AWD and 40 mpg at the speed limit, the Prius does not offer AWD and the RAV4 Hybrid only uses battery for reverse. So don't get stuck! Plus the Buick offers longer standard warranty than Toyota does.